We have made a learn to surf package that includes all the elements of an awesome surf holiday at Swell. Below you can see what's included in 1 week stay at Swell, if you are thinking about staying longer (or shorther), no problem, just send us a message and we will create a customised package for your needs. Don't hesitate to send us a message if you have any questions. 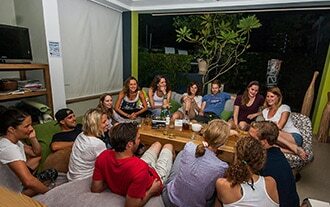 At Swell we do not rent rooms per night, instead we offer a full package for people that want to learn to surf or kitesurf or want to improve their (kite)surfing. Our driver will pick you up and drop you back off at Puerto Plata airport on the day of your departure from Swell. No problem just let us know and we'll make sure there's space. Other Airports? We can also pick you up at Santiago and Santo Domingo international airport. *Additional fees apply. Swell surf instructors will teach you surfing in a quick, safe and structured manner. 5 Mornings we teach at our local surf beach. 2 sessions per day of 1,5 hours each. Theory surf lessons at Swell are given twice a week. Use of the best beginner surfboards on the market (soft tops for safety) and includes leash, boots and Swell Lycra's. Not a complete beginner? Use our large selection of hard tops. Transport to and from the surf beach is done by Swell drivers, not need to rent a car. We serve our clients our famous healthy daily breakfast after their first surf session. Tasty omelette's, pancakes & crepes, fresh local fruit a variety of bread and tea or tasty Dominican coffee. We also serve 4 dinners at Swell where we try and source local organic food and serve tasty food all set at our large dinner table. 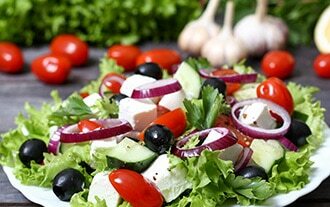 Have dietary restrictions? Send us a message, we can accommodate most people. Chill in the pool, lie in a hammock or shoot some pool? We set up Swell as your home away from home with a large communal area with a pool table, large dining / game table, surround sound system, TV with Media player and plenty of bean bags and sofa's to relax on. Free drinking water is also available, as well as an honesty bar system with other beverages. 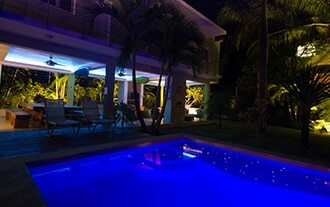 Our staff is from Cabarete, or has lived here for years, so can and will help you find the best bars, restaurants or organize and advice on any excursion you want to do. Because Swell is a very communal and social place, we surf together, eat together and go out for drinks together; it's real easy to make new friends. We have at least 1 staff member on site 24/7 and most Swell staff members are present during the dinners and breakfasts at Swell. Daily room cleaning service to make sure your room is spotlessly clean. All rooms have an en suite bathroom and an efficient fan. 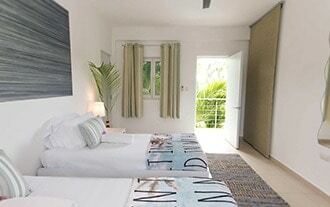 - Private rooms for 1 or 2 people with AC. - Shared rooms, with a maximum of 3 other guests. limited. Swell's capacity is only 20 guests, so spaces can fill up quickly.